Trends might come and go, but one thing is certain – their ability to provide us with inspiration is never ending. Barnebys offers a multitude of decoration ideas, iconic designs and original pieces that would provide any home with that certain ‘something’. Let’s start of with this summer’s colors. One of the most on trend hues this year is purple. For 2018, Pantone chose the color “Ultra Violet” as the year’s highlight, partly in honor of music legend Prince. Who doesn’t love Purple Rain? 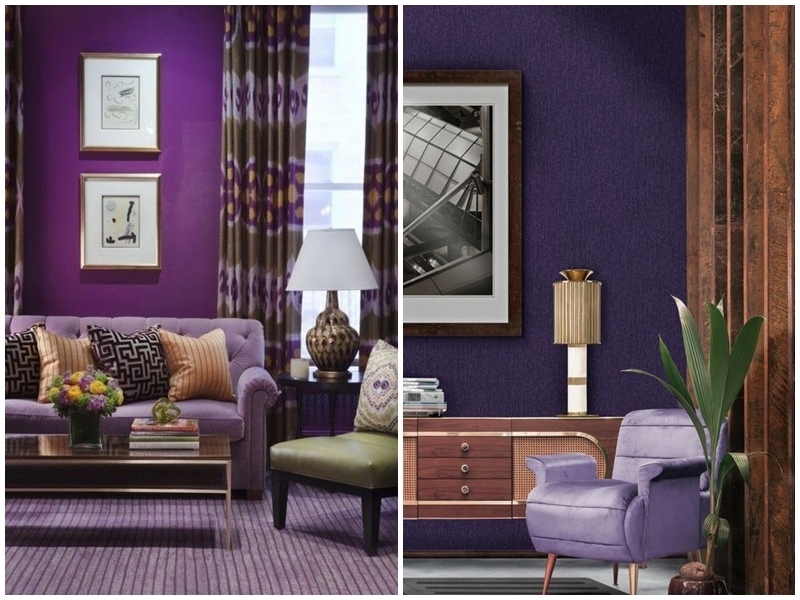 Violet shades helps create calm, meditative spaces while keeping the room bright and rich. Left: LOWELL BLAIR NESBITT. "White and Violet Iris" (1982). Photo: RoGallery Online. Right: LORENZA BOZZOLI DESIGN. 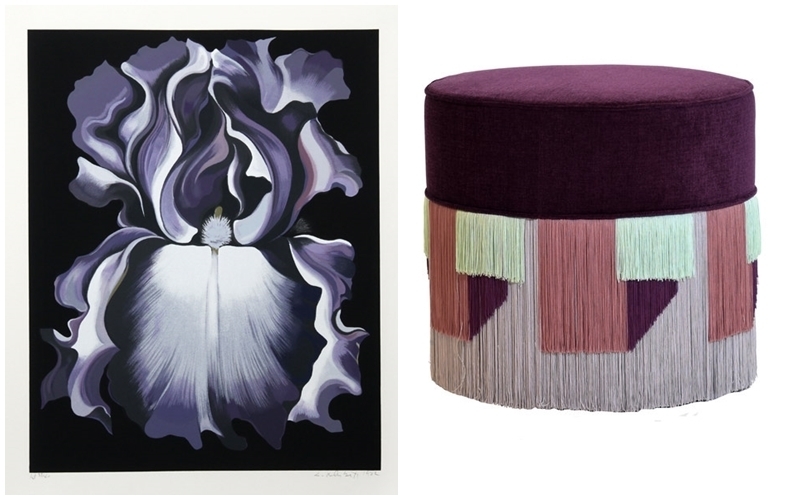 Pouffe in beech wood upholstered in violet velvet and geometric fringe decoration. Photo: Artemest. 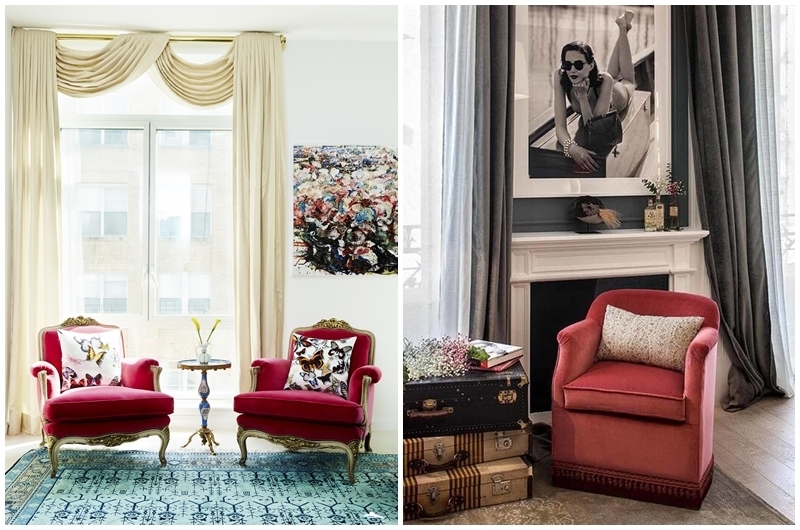 Left: Red chairs in a chic SoHo apartment. Photo via catalysticmedia.com. Right: his cherry red sofa was seen at Casa Decor 2018. Photo via Casa Decor. The late fashion designer Bill Blass once said, “red is the ultimate cure for sadness” and we couldn’t agree more. With its romantic and energized undertones, the color red is one of this year's leading colors when it comes to decorating. Red is ideal when it comes to loungers, sofas and chairs, as it draws prominent attention and is impossible to ignore. Red is for the daring who won’t let any space turn dull. Passionate and strong, red is a color full of vitality. 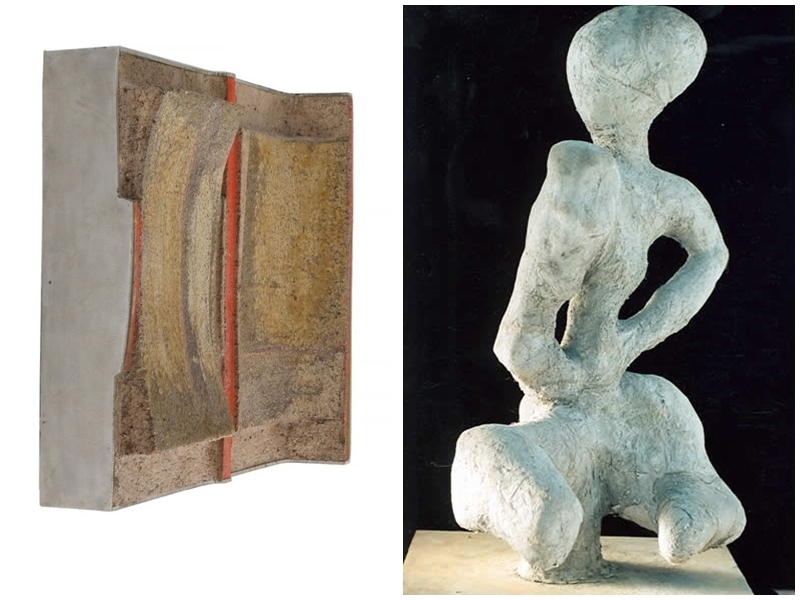 Left: ANTONI TÀPIES. "An inexhaustible hope" (2004). Photo: Royal Auction. 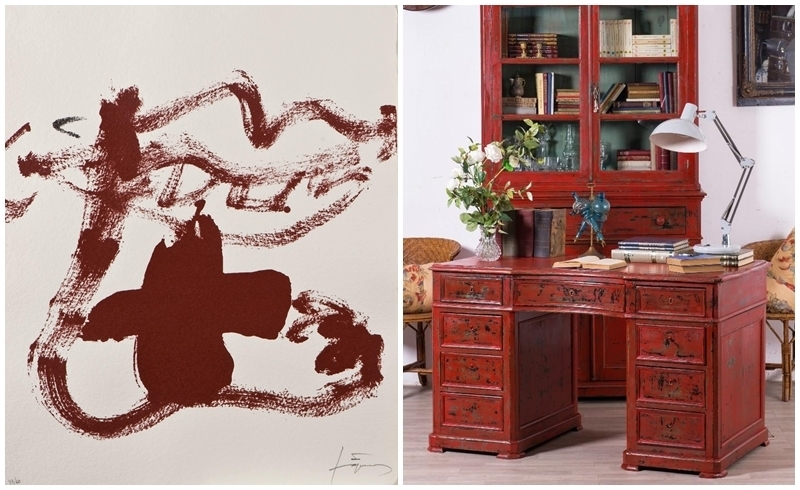 Right: Antique desk turned red (19th century). Photo via: Allcollection. Teal walls. Photo via: Los Angeles Times. 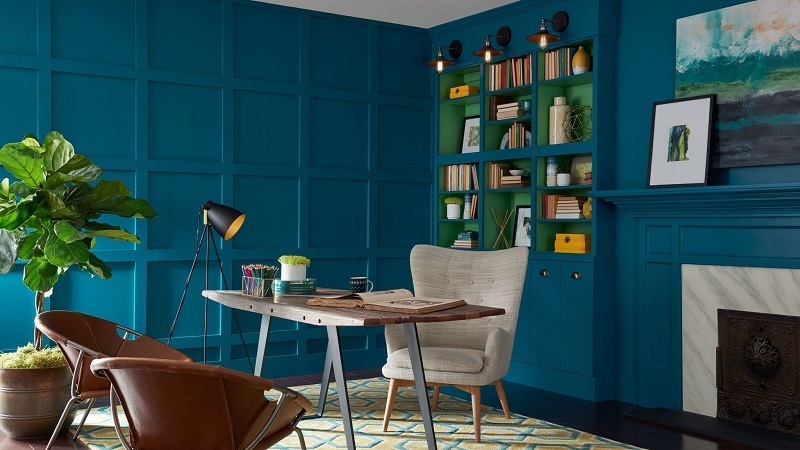 Halfway between green and blue, teal brings freshness and a sense of relaxation to the environment. As several dominating brands of paint have chosen bluish green for their color chart of 2018, this ocean-inspired shade will be easy to find, if you have the courage to repaint your walls in it. Left: MARINA BENITO. "Blue cactus". Acrylic on paper. Photo via: A place for Art. 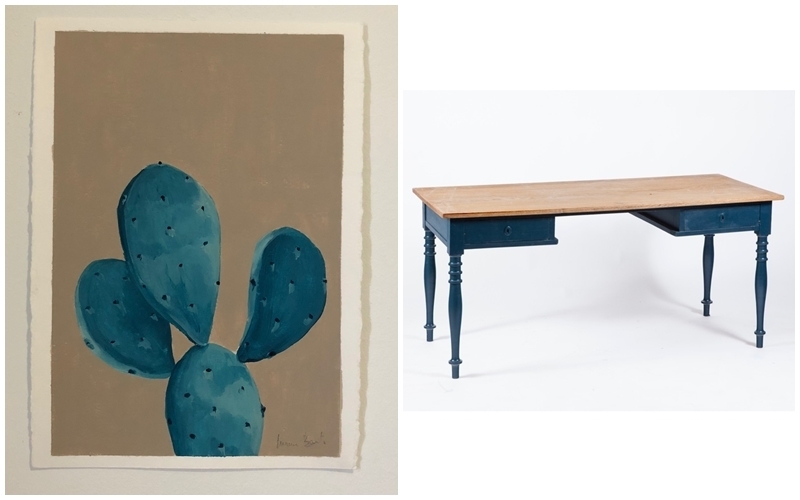 Right: Rectangular polychrome wooden desk in blue. Image via: Goya Auctions. Black and white decor - never goes out of style. Photo via: mydeal.com. Can you really call black and white trendy colors, since they never go out of style? The lure of this dual color couple is its many forms – together, the colors create contrasting effects and offer great variation due to different prints, patterns and designs. Tiles, textiles, ceramics, walls and furniture, there’s no limit to what black and white combinations can do. 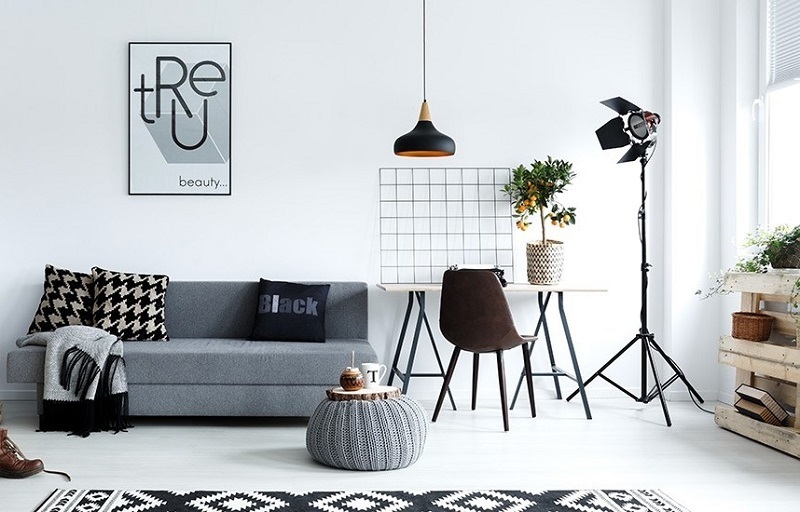 The color combo adds visual interests to any space, and if it’s done in proper proportions, black and white will add a feeling of balance to your room. Left: WILLIAM DEY. "Pool abstraction". Photography. Photo via: Zatista. Right: ISABELLA COSTANTINI. 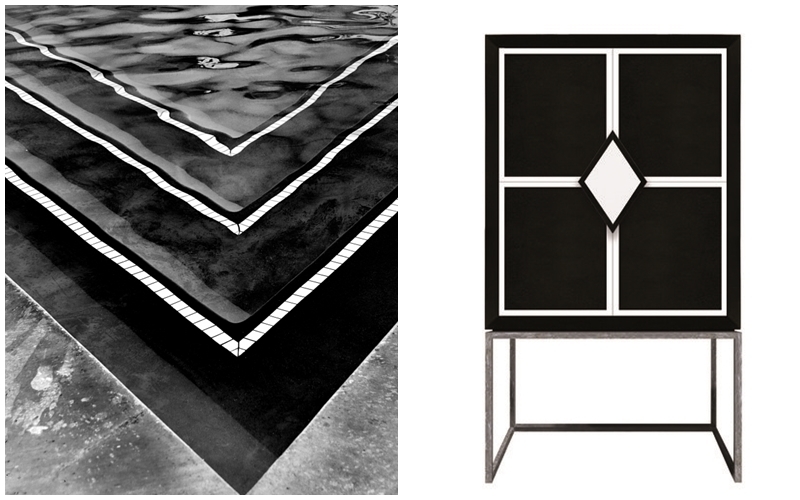 Lacquered furniture in black and white with metal frame. Image via: Artemest. 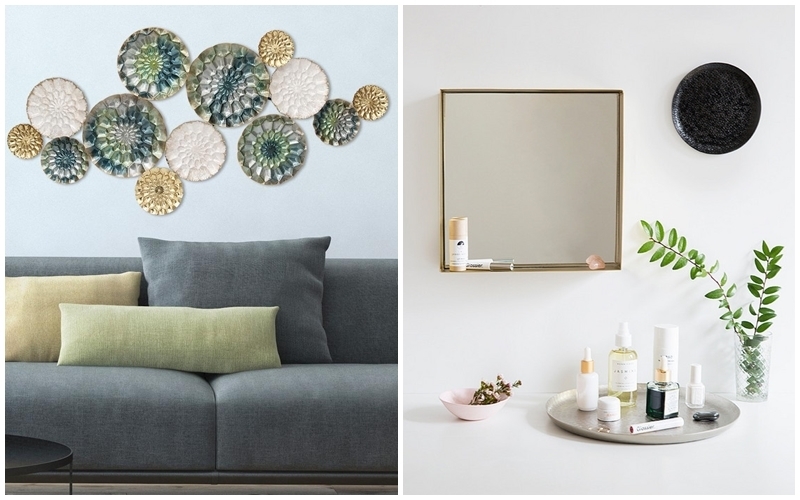 But it’s not just certain colors that will bring your room a new lick of life this year, and if you’re not in the mood for repainting your walls or changing out your couch, go with this year’s trending materials instead. Left: Concrete walls. Photo via: italianbark.com. 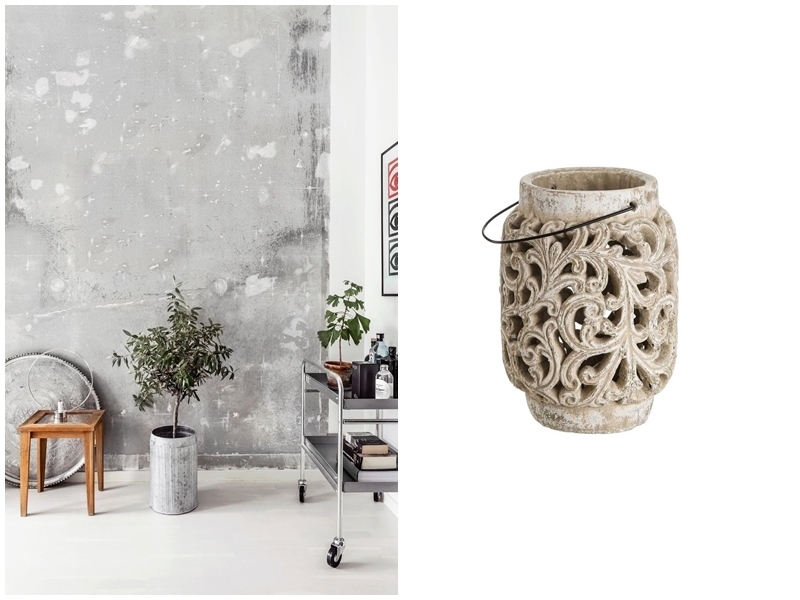 Right: Candle holder in concrete. Image via: Kamir. First up is concrete. It’s a ideally used in small doses, whether as vases, figurines or pots as it brings a certain feeling of rawness. If you’re really into the unfinished feel, why not leave your walls bare to achieve this industrial look. Just be careful though, as with lots of concrete, you’ll have to work harder to make your space cosier and warm. To bring out the best in this raw material, combine it with other pieces in natural materials such as leather and wood. Left: ARNE L. HANSEN. Wall hanging. Photo via: Bruun Rasmussen. Right: JENIK COOK. "My ET". Sculpture in concrete. Image via: RoGallery Online. Left: Let multicolored metal circles decorate the wall. Photo via: homedepot.com. 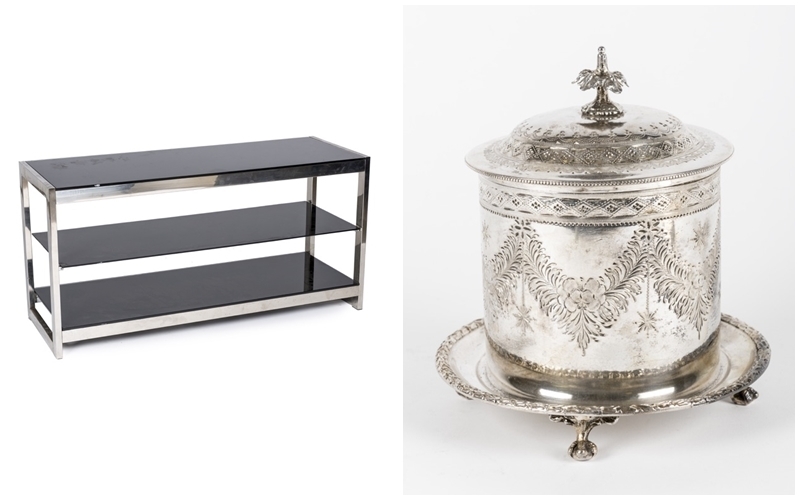 Right: The decoration trend in metal. Photo via: Domino Magazine. This year we see metals are still one the decoration world’s top materials, whether if it's in the smaller details or as the dominating material of a piece or furniture or covering an entire wall. Golden, copper or oxidized metals, the choice is yours as you fully hit one of the biggest trends of the year. Left: Low shelf in chromed metal and glass (80's). Photo via: Goya Auctions. Right: Photo via: Goya Auctions. 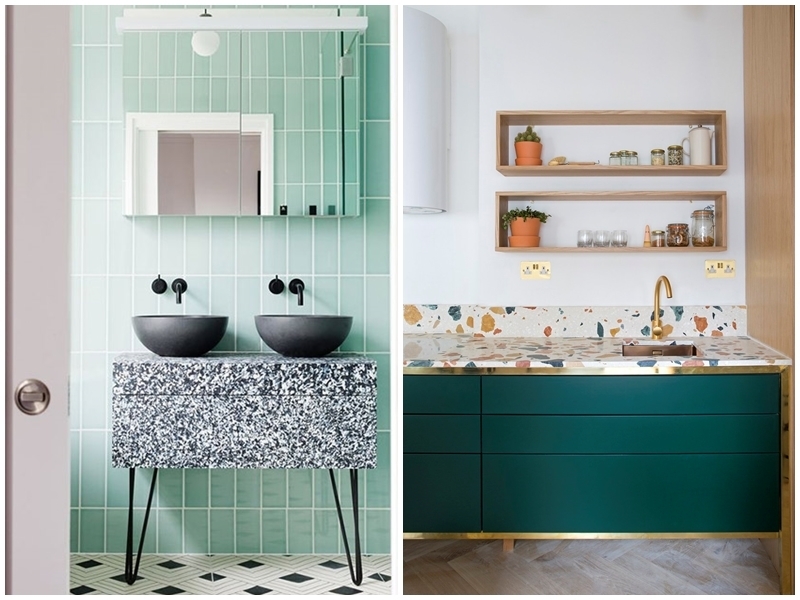 Left: Bathroom furniture in this year's terrazzo trend. Photo via: Hello Magazine. Right: The kitchen could also benefit from the use of terrazzo. Photo via: Eve Morgan Interiors. Terrazzo was one of the 1970’s biggest decoration trends, and it’s safe to say that the material has made a full comeback. Terrazzo is a mixture of different materials such as little pieces of marble, glass, quartz, granite or other nature stones mixed in a cement-like binder. This year, the trend invites us to use it for table or counter tops, vases or porcelain. Due to its durability, affordable price and great variety of colors and patterns, terrazzo can be used both indoors and outdoors. Beside, today's designers are inspired by terrazzo to create all kinds of products and accessories such as wallpapers and textiles. 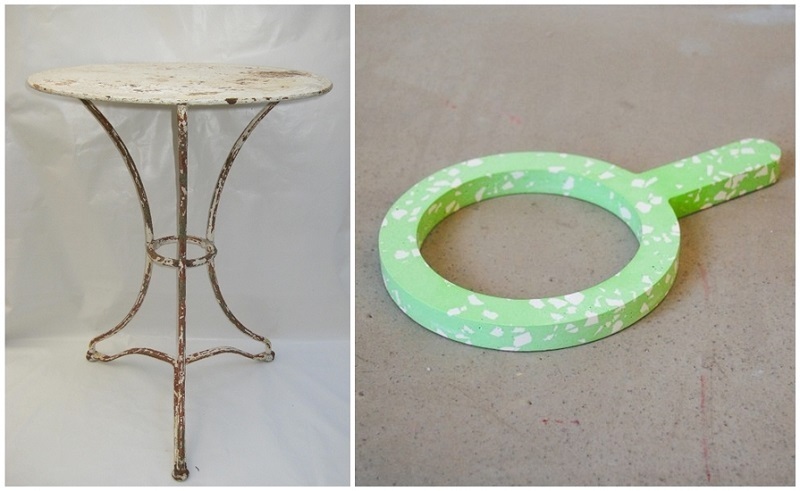 Left: Antique French garden table in terrazzo (c.1870). Photo via: Allcollection. Right: JOHANNA BERG. "Terrazzo issue". Work of art of the CLASS PONG project. Image via: Arrivals. If you’re in the mood to change up your space with these 2018 top trends, in a sustainable way, then Barnebys might be the perfect place for you. Discover Barnebys!